“Finally, in news studiously ignored by the mainstream media, parliamentary elections in Italy last week routed the Communists and the Greens and marked the third big victory for the Right in Europe after the elections of German Chancellor Angela Merkel and French President Nicolas Sarkozy. 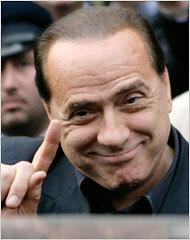 “The elections were a history-making win for the party of Italian Prime Minister Silvio Berlusconi. For the first time since the end of World War II, no one will represent the Communist Party in the Italian parliament. The Greens were also voted out. On the front page of the Richmond Times-Dispatch we get a steady diet of local gossip. You have to search for national and international news reports between whole-page advertisements for companies selling groceries, cell phones, and clothing. But lest you think my local newspaper is the only offender, check out the Washington Post and USA Today. You might find this story buried somewhere. What’s even more disturbing is the way the New York Times reported Berlusconi’s election. The unelected politicians that make up the editorial and “reporting” team at the Times did their worse to disparage the Italians and the man they elected prime minister. And I quote: “Silvio Berlusconi, the idiosyncratic billionaire …” focusing on his wealth because all socialists suspect rich people of becoming wealthy by robbing the poor. “In a moment of national self-doubt” raises questions about the collective intelligence and fragile psyche of Italy’s electorate. “Rejecting the sober responsibility of the departing prime minister … ” insinuating that his predecessor was sober and responsible in comparison to Berlusconi’s “… clowning and corruption scandals, his rocky relations with his wife and political partners, his growing hairline and ever browner hair …” Good grief! No hinting here. The New York Times doesn’t like his politics, his attitudes, his marriage, or his hairline. What really irked the Times was that Berlusconi knocked out the Italian Democratic Party’s nominee for the office of Prime Minister. They defended the DP nominee by saying that there was “no difference” in the proposed solutions each man offered to the Italian people, but that Berlusconi won on style points and personality. As our world shrinks and our politics and human issues become more “global,” it looks like the only real source of news continues to be the Internet. At least on the Internet you can hear a variety of opinions. I’m so tired of the slanted “reporting” of the Socialist Party (read mainstream media) in our country. They don’t hold elective office, these (ironic, isn’t it) billionaires. They dictate the news.